The ikon Hemisphere® LCD Blender — The secret to the Hemisphere® Blade System is the continuous movement created inside the pitcher. 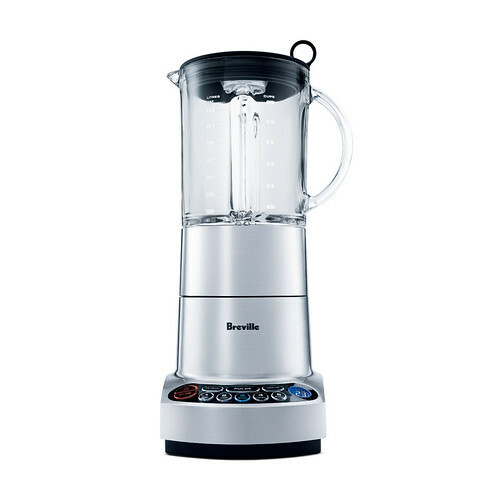 It combines the functions of a blender with a mini food processor for the ultimate in versatility. A. Inner Measuring Lid - for adding ingredients while blending. B. 51oz. Blending Jug - unique dual ribs continually pass ingredients onto the blades for perfectly blended results. C. Commercial Grade - heavy duty commercial grade components used for durability. D. Heavy Duty Die-Cast Metal Base - for long lasting professional performance. E. Illuminated Buttons - for clarity and ease of reading. F. Electronic 5 Speed Control Plus Pulse - electronic controls ensure that the RPM speed is maintained for consistent results every time. G. Breville Assist™ Lid - unique ring pull design ensures the lid is easy to remove yet sealed tight during operation. H. Stainless Steel Blades - extra wide blades are contoured to the base of the jug so there are no food traps. I. Hemisphere® Blade System - allows for continuous movement inside the jug leaving no 'still' spots. J. Blade Removal - one twist and the blades are easily removed for fast and easy cleaning. K. Pre-Programmed 'Ice Crush' and 'Smoothie' Settings - automatically alter speeds to optimize blending results, then switch off automatically. L. LCD Display - counts up on speed settings and down on pre-programmed settings for complete control while blending. M. Cord Storage - located beneath the blender so the cord is secured and out of the way. 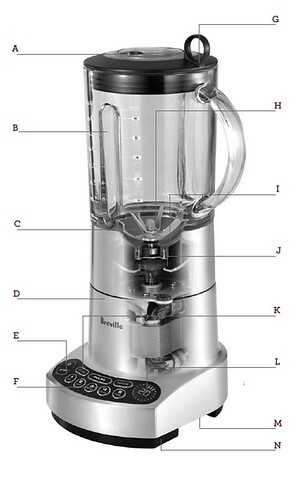 N. Non-Skid Feet - helps ensure that the blender is steady during operation.